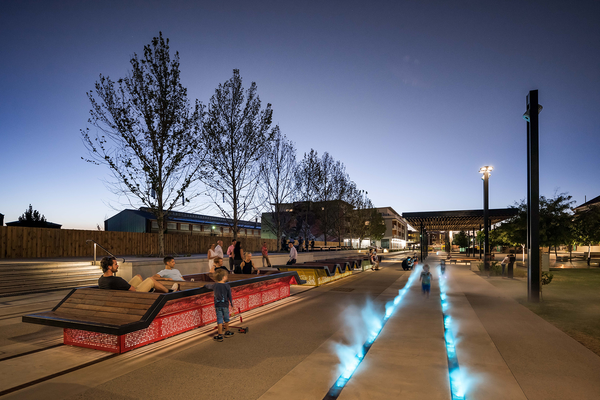 The revival of Auckland’s Jellicoe Street, North Wharf Promenade and Silo Park by Taylor Cullity Lethlean with Wraight + Associates seeks a balance between contemporary urban waterfront and sensitivity to the industrial maritime past. 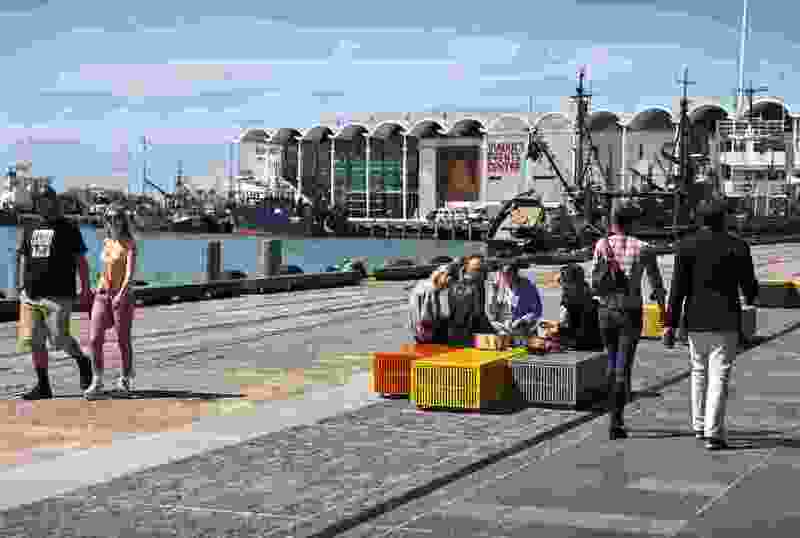 Public seating elements made of crates along the north wharf promenade edge. Fine grain granite sets blur the boundary between private and public space. 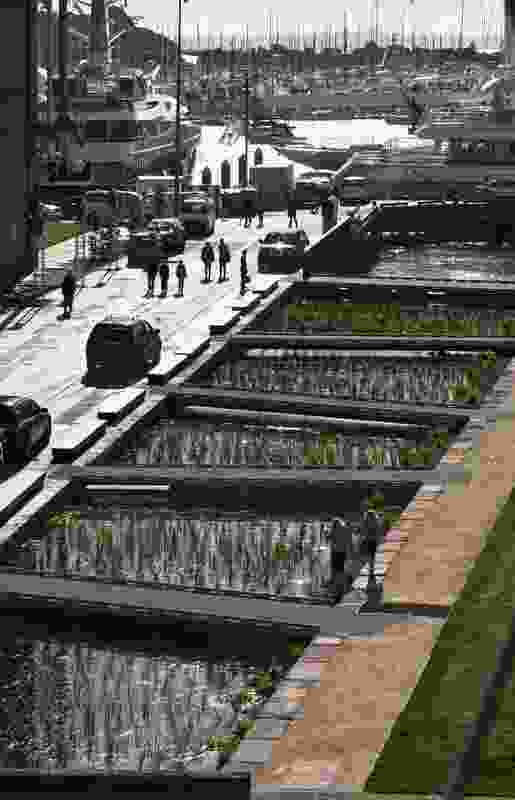 From the landscape architect: Waterfronts in the post-industrial age are seen to play a critical role in the cultural positioning and branding of cities. To this end, they are often the target of extensive urban regeneration and are sites of significant public and private investment. People are drawn to them because of their gritty, industrial and maritime qualities, yet contemporary waterfront redevelopments are often defined by the removal of these characteristics. At Auckland’s Wynyard Point, however, in a project to transform a forlorn industrial and maritime area into a layered, mixed-use precinct, this conventional, sanitising approach is being challenged. 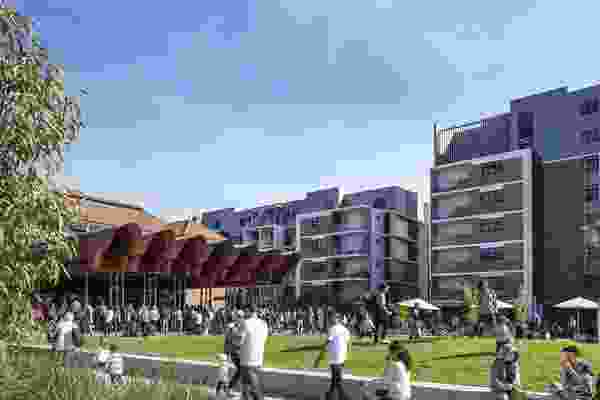 Waterfront Auckland engaged Taylor Cullity Lethlean and Wraight + Associates to undertake the first stage of mixed-use development Wynyard Quarter. This 3.7 hectare precinct is made up of Jellicoe Street, North Wharf Promenade and Silo Park. Here, unlike in the typical approach, waterfront memory is preserved - fish smells, rusted steel, grit and patina are embraced in the scheme and derelict artefacts are reprogrammed. Three key moves underpin the design of these spaces: the retention of the existing fishing and maritime industries, the revealing of artefacts and the interpretation of the site’s peculiar archaeology of materiality and patterns. Jellicoe Harbour (situated adjacent to the North Wharf Promenade) is used for a diverse array of purposes, including container shipping, ferry services and commercial fishing. Previously, these activities were conducted out of the public eye. Now, however, they are part of the public realm experience and integrated as attractions. The design weaves public realm experiences around these “as found” conditions. 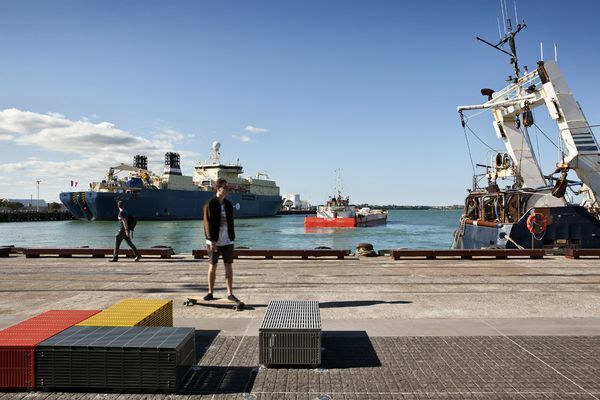 The harbour edge, North Wharf, is now a site of negotiation, a pedestrian promenade furnished with crate seats from which to observe and experience the waterfront’s industry. It is also a site of contrasts, the rusty patina of working wharves set against the lustre of new alfresco eateries that have thrived here. Jellicoe Street runs parallel to North Wharf Promenade and sits in contrast to its hard and exposed condition. A grand axis with a pedestrian focus and rich, informal planting, this “boulevard” establishes a new language for the public realm of Auckland, one that promotes a civic presence with an indigenous character. Through the narrowing of the overall road dimensions and the introduction of a new tram network, Jellicoe Street prioritises pedestrian circulation over heavy vehicular traffic. The introduction of rough sawn granite setts (paving blocks), fingers of sub-tropical rain gardens, seating and bicycle lanes, encourage a human-scale interaction with the street and the adjacent Auckland Fish Market. To the north of Silo Park the gantry is 100 metres long and nine metres high, designed as part folly / part lookout, arbour and event framework. 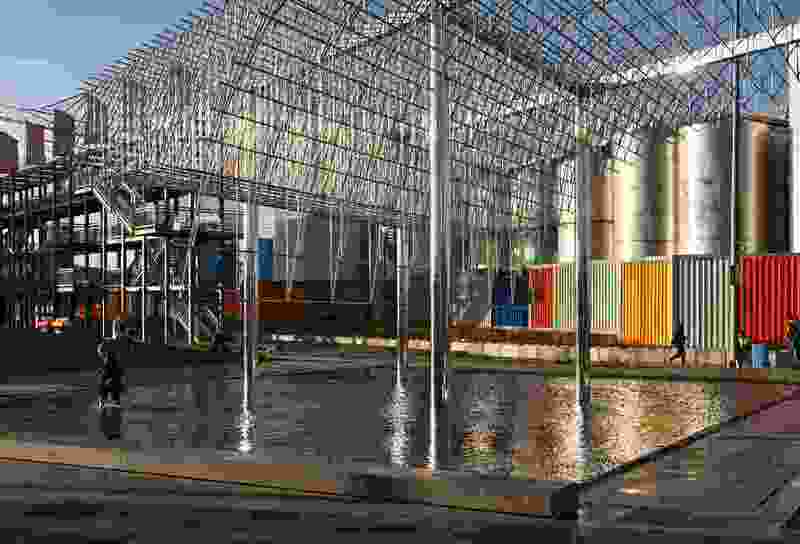 Silo Park links North Wharf promenade with marine industries to its west. 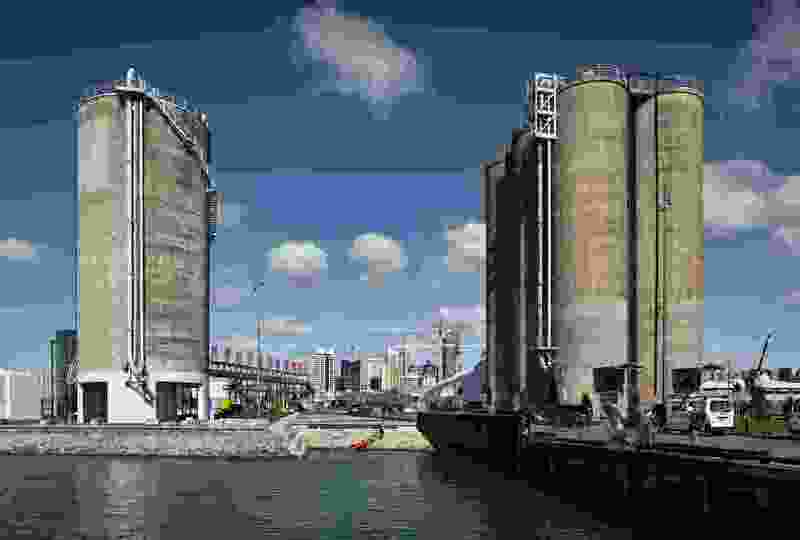 Silo Park is located on a former cement depot, and a large silo that was once earmarked for removal has been retained, forming an iconic landmark. 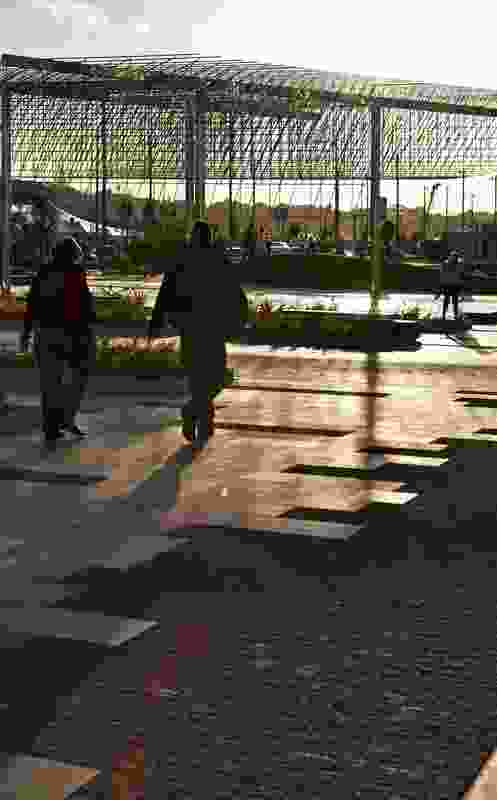 The park’s tilted corners resemble the bunds that are used to prevent industrial silo spills – another alludion to the site’s former uses. 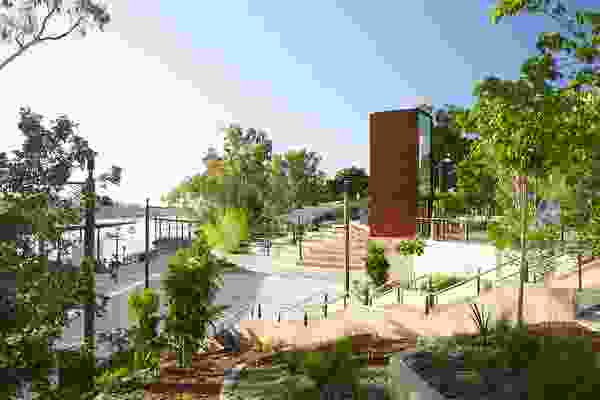 The park now hosts a variety of public functions as passive recreation, events space, youth precinct and weekend market. Adjacent to Silo Park is a large bio-retention wetland that collects stormwater from the wider site. The historic wharf edge has been revealed here with the removal of declaimed fill. Indigenous planting also references the site’s conditions pre-industry. 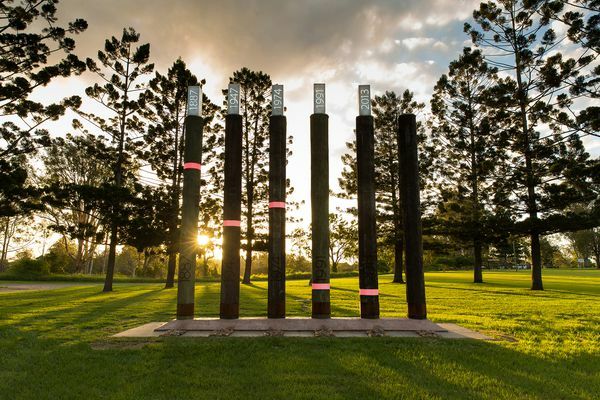 This, along with the planting of the Jellicoe Street rain gardens, references an important element of Maori culture – the viewing of a green edge when approaching land. Water cascades from here into the harbour via large water stairs which act as both rip rap wall (shoreline rock armour) and a place to engage with the harbour’s dramatic tidal changes. 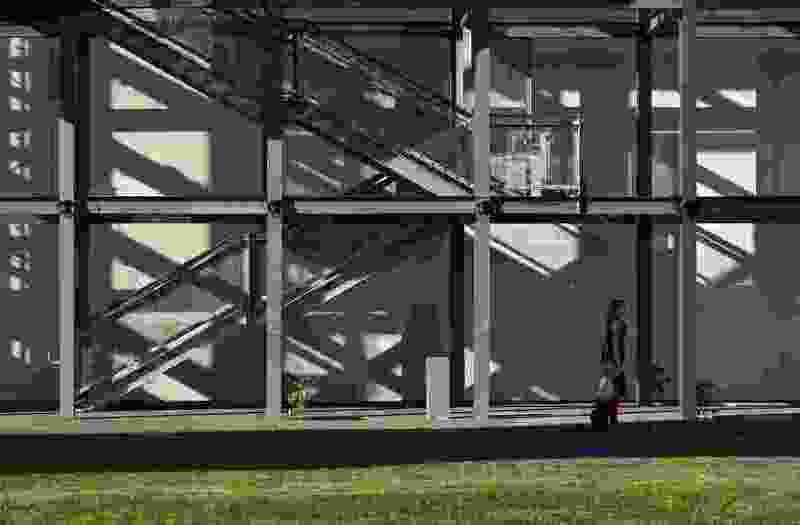 The stairs comprise reclaimed precast concrete units previously utilised for the storage of manufacturing materials – again, a local narrative has been salvaged to articulate a new one. Seating blocks and new path edges also utilise materials from both the cement works and steelworks that once existed here. These overlapping programs are orientated via the armature of a gantry to the North, an evocative response to the industrial language of the site. The gantry is a 100-metre-long by nine-metre-high structure designed to be part folly, play structure, lookout, arbour and event framework. 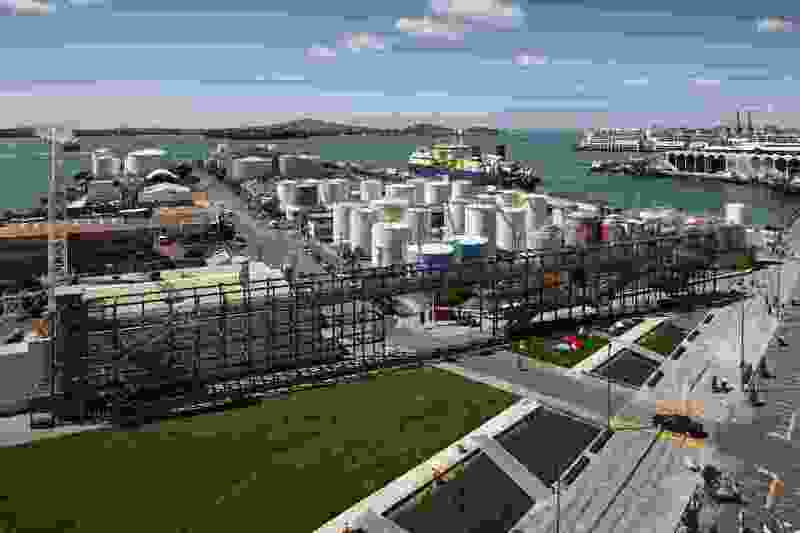 It is proposed that this facility be used for the final ‘fit out’ of large super yachts, a specialist New Zealand industry that may be introduced to the site when the next stages of Wynyard Quarter are underway to the North. By embracing a narrative of place, Jellicoe Street, North Wharf Promenade and Silo Park offer a public realm experience that is both contemporary and sensitive to the site’s history, culture and climate. The programmatic response adds new recreational activities to the site, yet is built from the pattern language, infrastructure and mythology of place. It is hoped that these qualities will inform the future development of Wynyard Quarter as precedent. 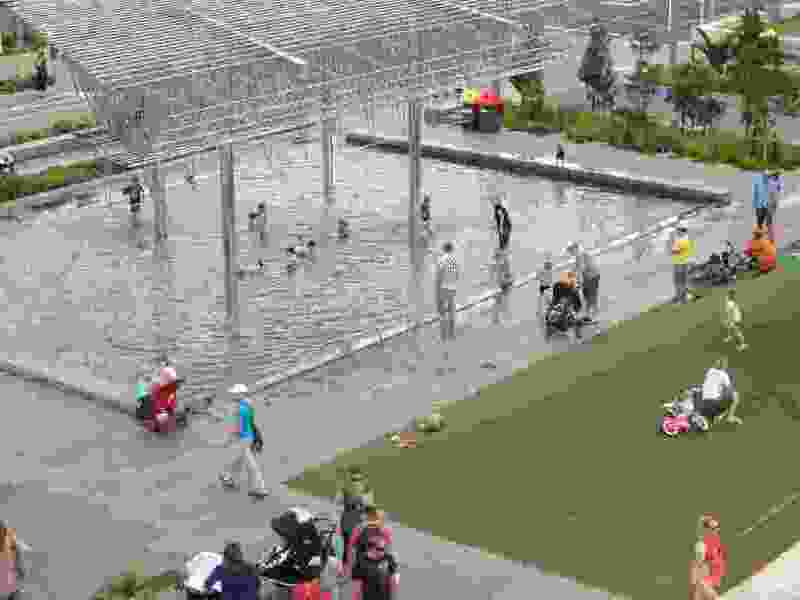 Here, a sense of ownership is beginning to emerge as the public reconnect with their city’s waterfront as a genuine public space rather than a privatised development. In November 2012, the Auckland waterfront redevelopment won the inaugural WAN (World Architecture News.com) Urban Regeneration Award. 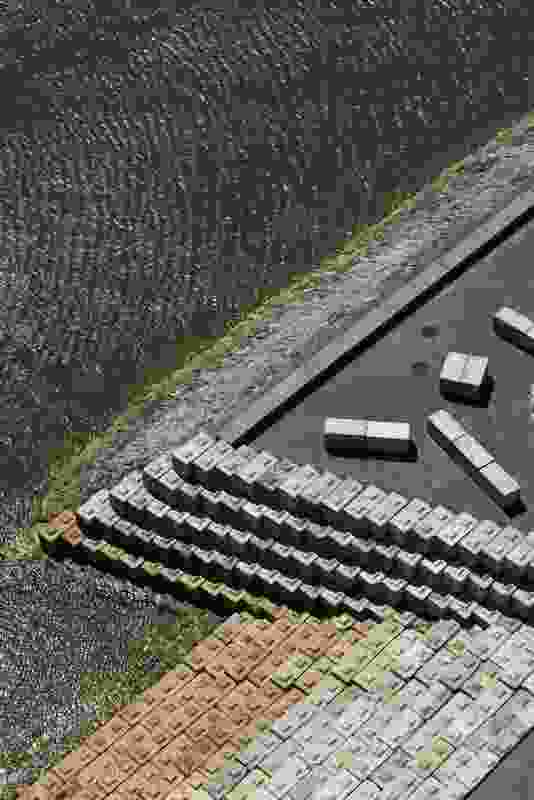 A marine revetment of recycled concrete blocks connects the wetland to the harbour, offering a place to engage with the dramatic tidal changes. Crate seats provide public seating elements along the north wharf promenade edge. 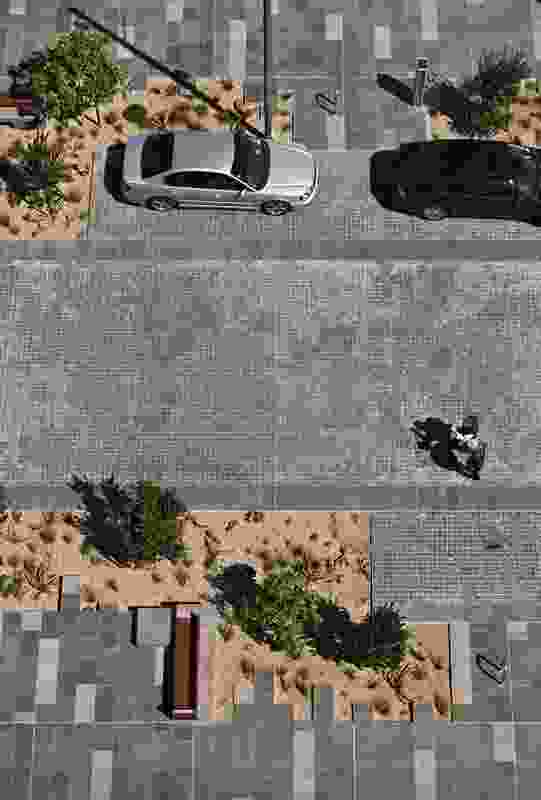 Fine grain granite setts blur the boundary between private and public space. Wind Tree Sculpture by Michio Ihara once sited in QEII Square then stored for the past ten years, now a centrepiece of Jellicoe Plaza on the Waterfront. Children enjoy the Wind Tree Sculpture water feature in summer. 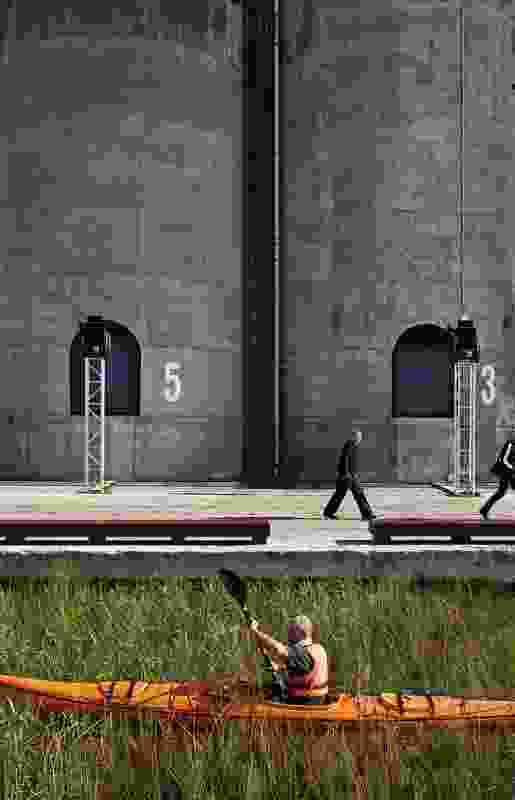 A continuous floating walkway within the fourth level of the gantry acts as a lookout to surrounding silos, cargo containers and the working harbour. 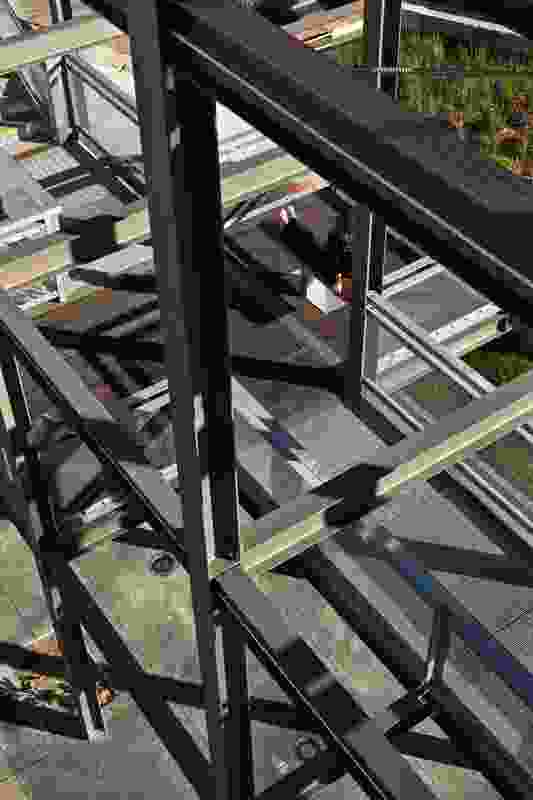 The gantry is based on a modular cube, fitted with staircases, viewing decks and a lift. Vines planted at its base will eventually transform it into an arbour. 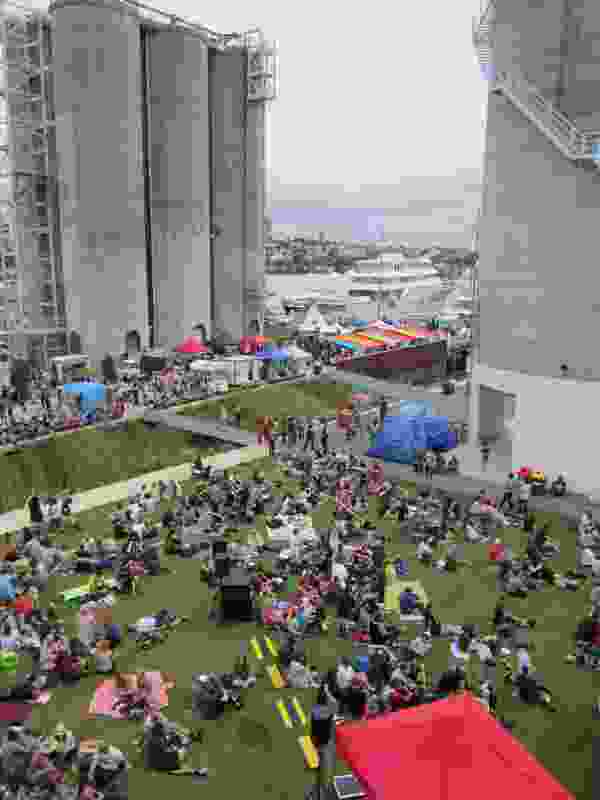 Silo Park and North Wharf during weekend market mode. The park also plays host to St Jerome’s Laneway Festival and moonlight cinema. 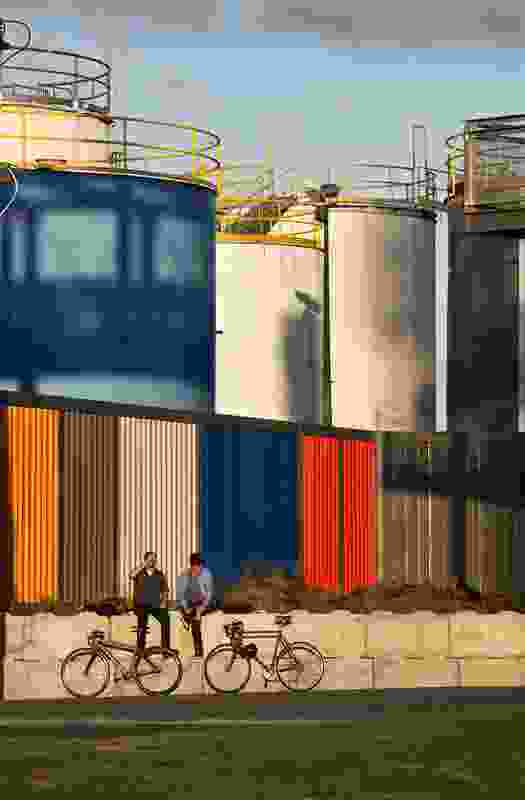 This multi-coloured industrial scale boundary fence to the North of Silo Park evokes shipping container forms. 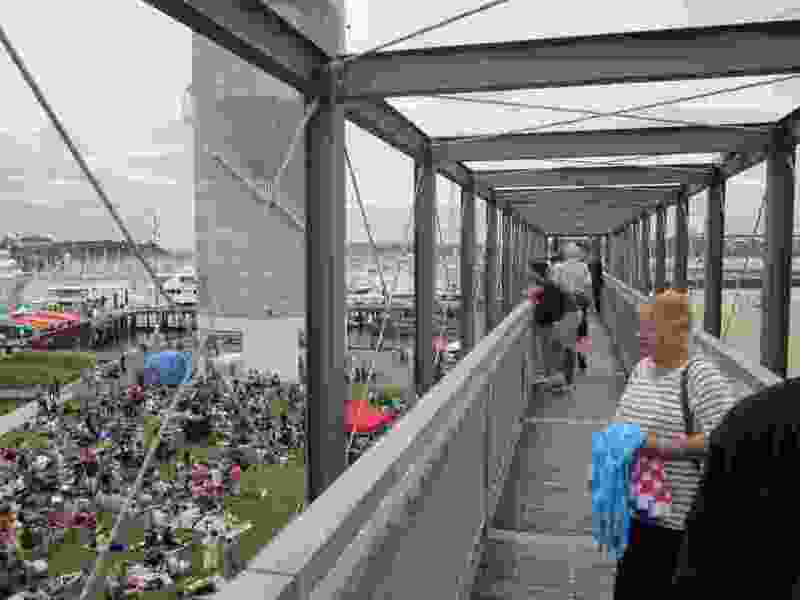 Lookout points within the gantry have seating elements to view the harbour and silo park. Textural contrast between granite setts and bluestone flagging is used to distinguish walkways from seated cafe zones. 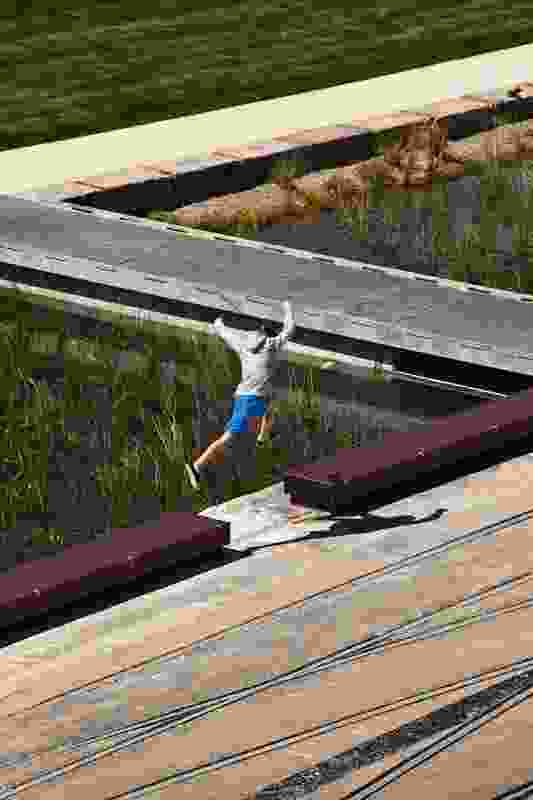 Adjacent to Silo Park is a bio-retention wetland collecting stormwater from the wider site. The historic wharf edge has been revealed with the removal of declaimed fill. A public ‘boulevard’ with a pedestrian focus and informal planting establishes a public realm language for Auckland promoting civic presence with an indigenous character. Along the North Wharf promenade, custom seating benches are scaled to allow for the fishing industry to unload. Former cement silos provide a backdrop to the promenade and wetland treatment feature. The water stairs utilise recycled concrete blocks from the former cement works located on the site. With future development of Wynyard Quarter the gantry functions as boat-building infrastructure for small or large vessels. 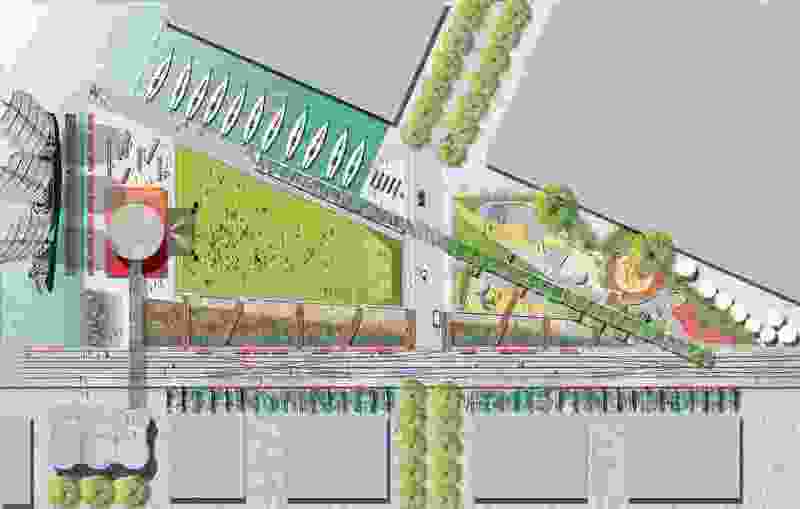 Concept Plan of Jellicoe Street, Silo Park and North Wharf Promenade.